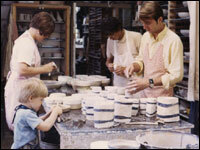 "Generations in Clay: The Kellogg Legacy Continues"
Monday - Friday 10 a.m.- 4 p.m.
Saturday 1 – 4 p.m. Closed on Sundays. Admission $1.00 per adult - no fee for children and for students. The Little Traverse Historical Society has been preserving history in the Little Traverse Bay region since 1905. 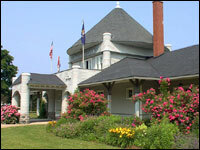 The Society operates the History Museum, which is located in the renovated 1892 Pere Marquette train depot. You are invited to the opening reception of "Generations in Clay: The Kellogg Legacy Continues." 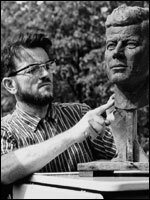 Come discover, learn and celebrate on Saturday, May 29, 5-8 p.m. View the art works of sculptor Stanley Kellogg and his grandson Eric Strader, both renowned for their work in clay. The opening reception will give you an opportunity to visit with Eric, who has continued the legacy of his famous grandfather. 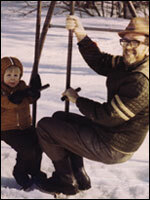 Stanley Kellogg lived and worked in Petoskey, Michigan, opening the Kellogg Studio in 1948. For nearly three decades, the Kellogg Studio was a Northern Michigan landmark, finally closing its doors in 1976. 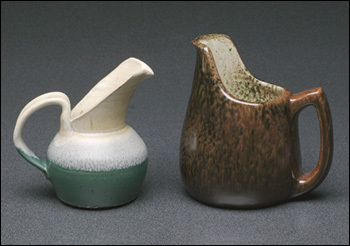 Examples of Kellogg Studio pottery from the Museum’s permanent collection, as well as from other private collections, will be on display. A smaller version of the horse that was outside of the Kellogg Studio. Click below to view samples of the potters' work on display! Eric Strader grew up around his grandfather’s work, and was inspired to become a clay artisan himself. 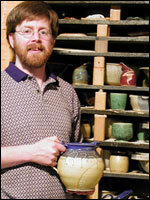 Eric, now of Goshen, Indiana, produces functional pottery as well as beautiful, one-of-a-kind woodfired wares. 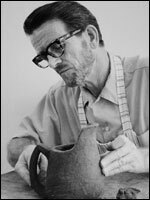 His work is displayed in galleries and at ceramics shows throughout the Midwest. 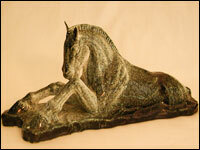 Visit Eric’s website: www.ericstraderpottery.com. Meet the Kellogg family and former employees of the Kellogg Studio as they will transport you into their world of art. This Exhibition will continue through December 22, 2004. Please call (231) 347-2620 for more information. 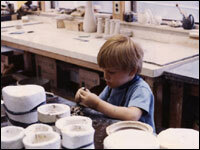 Eric Strader, as a child, in his grandfather's studio.